Not only does wine have a delightful taste, but it also has many benefits for your health! A diet rich with wine, especially red wine, is known to have health benefits for your heart and longevity. Here at Jonathan’s Ristorante, an Italian restaurant in Huntington, we have a large selection of wine and a great variety of delectable French wines. Visit us and enjoy a glass of wine; there are more health benefits than you think. Preventing cancer and cardiovascular diseases. Boosting the health of your endothelium (tissue lining your heart and blood vessels). The wines of the Sud-Ouest region have more procyanidins than most Cabernet Sauvignon and Merlot. Reduces chances of getting Type-2 Diabetes. About 3,000 cases on average of Bordeaux wine are made each year at Chateau La Grave, Pomerol. Champagne, Pol Roger, Reserve, France was the champagne that was served to His Royal Highness Prince Harry of Wales and Ms. Meghan Markle at their wedding reception at Windsor Castle. Visit us at Jonathan’s Ristorante, an Italian restaurant in Huntington, to try some of these lovely wines from France! 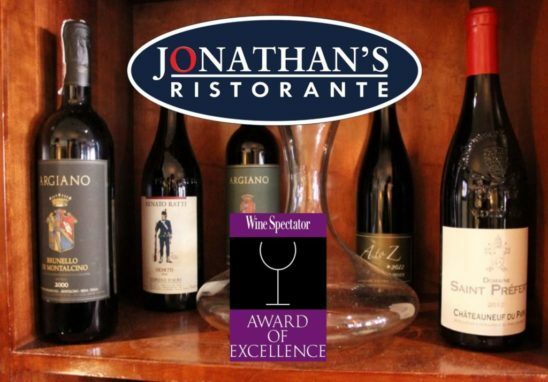 Here at Jonathan’s Ristorante, an Italian restaurant in Huntington, we have a large selection of wine and a great variety of delectable French wines.